A few months ago my mother was in the hospital. I spent several nights in there with her. To pass the time, my sister purchased an adult coloring book and coloring pencils for me. From then on, a hobby was born. I found that coloring helps relieve stress and takes my mind off things. It's beneficial mental relaxation. My mother has taken up the hobby too, and spends a lot of her days coloring in pages. It's been a whirlwind of gel pens, pencils, and markers! One company that I've come across and really like for their adult coloring books is Phoenix Yard Books. Based out of the UK, their adult coloring books are quickly moving up in the ranks. I received three different sizes of books from the company. The One and Only Enormous Colouring Book for Adults is larger than your average book. It includes 30 poster sized pages of various artwork and designs. The pages are perforated and one-sided, meaning there's only one design per page. It's suitable for when I'm at home. There's times I lay it on the floor to color and relax while watching TV. The One and Only Colouring Book for Adults is a little smaller than average coloring book and also has a wide variety of designs and patterns to choose from. There are 144 pages to this book. It has pictures on each side of a page. The Second One and Only Mandala Colouring Book is the second in a series of books with mandalas to color. There are 72 pages to this book, with pictures on each side of a page. The pages are more square than long. Mandalas are known to be a source of meditation and wisdom. I'm sure I don't get any wiser coloring from this book, but it sure is calming and soothing. The paper quality of all three books is favorable for coloring pencils, pens, markers, and other utensils. I have gotten much enjoyment out of coloring in these books. Some designs are more intricate than others, but they're all skillfully arranged. I've even taken a couple of the pictures and framed them to put on the wall after coloring them. While I thoroughly like all three books, my favorite is the book with all the mandala designs. I definitely recommend these adult coloring books, as well as the others that are available, to purchase as gifts for the enthusiast or for yourself as a source of relaxation. I'm most excited to color the mandala one! First I would like to try The One and Only Enormous Colouring Book for Adults. Which one am I most excited about? Oh, wow! Thats a tough one. I would have to say the The One and Only Colouring Book for Adults. But they all look very appealing. I'd want to color the Mandala Colouring Book first. I'm excited about the The Seond One and Only Mandala Colouring Book. The One and Only Colouring Book for Adults. The One and Only Enormous Colouring Book for Adults. I am most excited about the The One and Only Enormous Colouring Book for Adults! It would be great to have a large picture to work on! I would colour the The Second One and Only Mandala Colouring Book first. The first one, with the butterflies. I l9 e to color. It's very relaxing. I like the One and Only Coloring Book for Adults. These would be fun. I like the Mandala one! I would like to color the The Second One and Only Mandala Colouring Book. I like the pictures. The One and Only Enormous Colouring Book for Adults so I can color a page and possibly frame it! My sister has MS and these would be for her. I think her first choice would be the Enormous Coloring Book. I will be colouring in the The Second One And Only Mandala Colouring Book first. I can't wait to try the Mandala coloring book. I love the geometric type designs. The Mandala one, looks like so much fun! I would start with the Enormous colouring book, but they all look amazing! Definitely some of the nicest ones I have seen. I'd love to colour the enormous colouring book first! I'd try out the One and Only Enormous colouring book first. I have been wanting to try these adult colouring books. I want to start with the One and Only Enormous Colouring Book! One and Only Enormous Colouring Book for Adults is my favorite. The Seond One and Only Mandala Colouring Book. I'm excited for the enormous coloring book! I am most excited about The Second One And Only Mandala Colouring Book. I actually got my mom the One and Only Colouring Book for Adults and I flipped thru it and wish that I had gotten one for me as well! So I'd pick that one! I think I would start with Mandala first. Looks like fun! I like the One and Only Enormous Colouring book. I would like to start with the Mandala coloring book. I am most excited for The One and Only Colouring Book for Adults. The Second One and Only Mandala Colouring Book. Love the patterns in that one. I'm excited for the One and Only Colouring Book for Adults. They are all great, but I think I would most like the Second One and Only Mandala Colouring Book. I would love all of these adult coloring books. I would pick the one and only adult coloring book. I am most excited to color "The One and Only Colouring Book for Adults" first but I love them all! I'd use the Mandala one first!! I hope your mom is doing better! I like the enormous coloring book! we love coloring haha. I think The One And Only Enormous Colouring Book For Adults would be the one I would want to color first! I would love to win these. I am rather addicted to coloring. I'd love The One and Only Enormous Colouring Book for Adults! 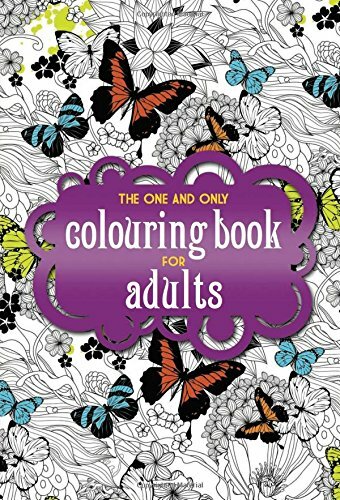 I'd be happy to try the One and Only Colouring Book for Adults first. I am most excited to try The One and Only Enormous Colouring Book for Adults coloring book. Sounds like a lot of fun - would start with the The One and Only Enormous Colouring Book for Adults. Happy Holidays! I'm most excited to color in The One and Only Enormous Colouring Book for Adults!